CutMarks: The new steam punk styled guitar! The new steam punk styled guitar! 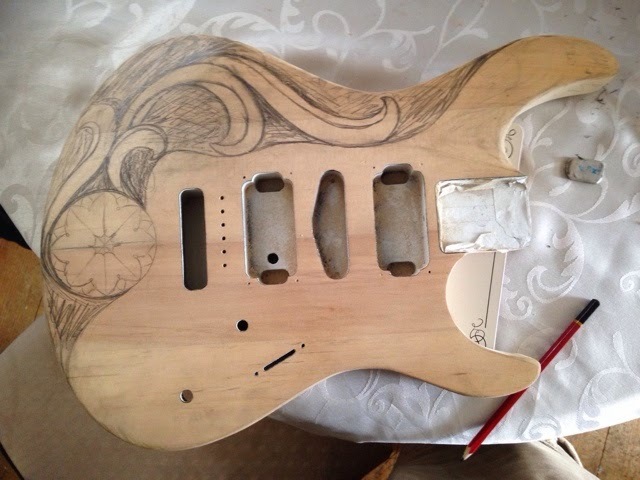 As the hand carved, acanthus leaf guitar nears its completion. I turn my sights on to my next project. Those of you who follow me on Instagram may have already seen a sneak peak of it! If you're not following me..... Errr.. Why not? So... this guitar started it's life many years ago. Solid black colour. Built by Yamaha. The standard sort of thing a teenager buys from Argos to be the next rock n roller or to get female attention. Then never actually ends up playing it. Turns out this was no exception! I was about 18 when a friend offered me this guitar. They finally came to the conclusion it wasn't going to get them laid or in a famous band, and was just taking up beer and video game space. Of course, as a long haired teen in a band, it was all about owning loads of guitars! So I took it on board and displayed it on my wall alongside many others. Only problem was, I never played it either! So it travelled with me to different homes. Sometimes it lived in clutter, other times it simply disappeared into the attic. Now I feel it's served it's life sentence for being the Argos standard, and needs to be turned into something beautiful and live the rest of it's life, loved and admired. First things first, I need to tear off it's plasticky skin, sand it down and cut it up! I'm sure it'll thank me after! Not knowing where to go on this one, I began simply doodling on it, basic leaf patterns. Refining it over and over, until I came to a look I was happy with. The doodles began forming a void below the bridge as though something cool had to go there. A centre piece if you will. At first I drew a basic rosette to carve, but that jus didn't hit the spot for me, so I headed down the local junk and furniture shop. You know the sort of place, filled to the ceiling with antique furniture and old bits of tat and unknown objects. 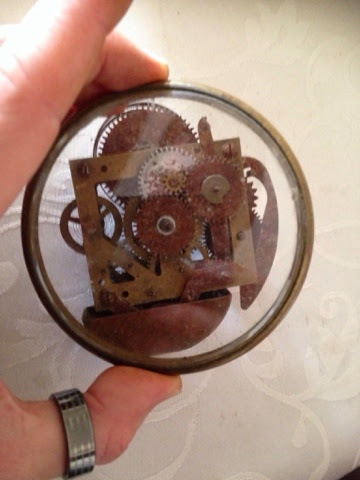 Within this vast building, I come across a small box filled with rusty old clock parts and glass clock fronts. Something draws me to them. I want to carry on looking around but I uncontrollably keep picking up the same items. I take it to the desk where the staff carefully wrap up this ancient, broken, rusted piece of a clock like it's a precious artefact. I chuckle to myself and pay my one pound for it. I'm still not entirely sure what I'm doing, so I just wing it! 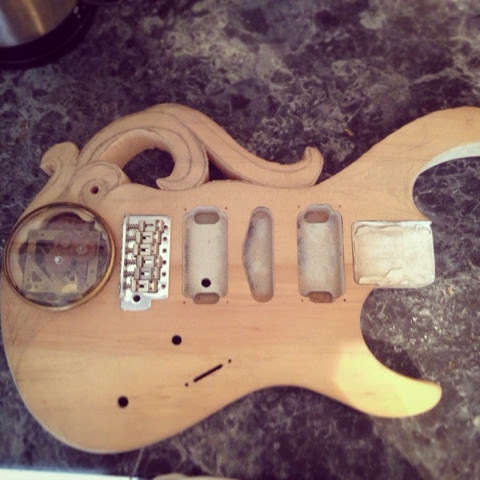 I cut up and dismantle a couple parts of the clock so it fits within the space and slowly recess it within the body of the guitar. It fits perfectly and I fit the glass front over the top. The leaves are blocked out and the clock parts are slotted in. Next job is to shape the leaves and add an LED to give the clock mechanism some back light. That should make it pop on stage. I'm thinking red or blue but suggestions are more than welcome! Well that's it for now please follow me on Facebook or Twitter or Wordpress or blogger or tumblr or Pinterest or Instagram..etc etc for updates and share share share!